A winner and a peek! I nearly forgot that I owe you all a winner! It's been a crazy busy kind of day in my neck of the woods, but in a good way. Without any further ado, the lucky winner of a copy of Quiltmaker's 100 Blocks Volume 5 as well as one of my patterns is Lucy, of Charm About You! Congratulations, Lucy, I'll be emailing you shortly! 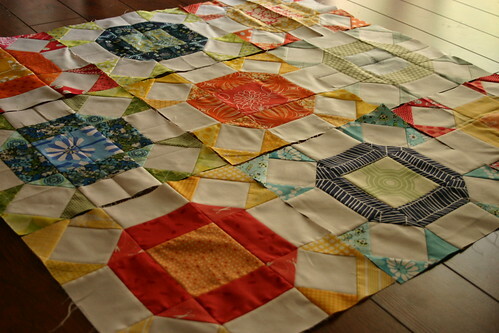 And because I can't post without a new picture, here is a sneak peek of my Radiant Ring quilt, coming together thanks to the awesome ladies of the Stash Trad bee. I've almost got all of my blocks now, but I'm digging this one so much that I'm going to be making some additional blocks myself to make the quilt bigger. The blocks I've been getting in the mail are so awesome, I just love this bee! This year, I'm having a lot of fun with the Stash Trad bee. 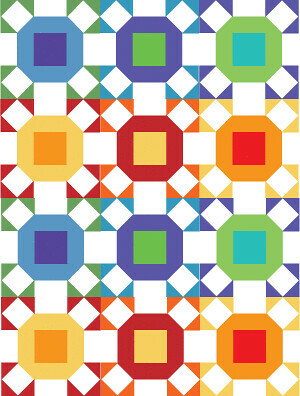 It's a group of amazingly talented quilters who have a love for messing with traditional blocks with a modern twist. Lee made us a fabulously apropos button for the bee, with that very motto in mind. April is my turn in the group, and I waffled a lot this month, thinking about what to ask the girls to make for me, and I kept coming back to the Rolling Stone block, which dates as far back as 1898, credited as being listed in the Ladies' Art Company Catalog. This block tutorial is written for using one neutral color as well as three additional contrasting colors. In my block, I used warm colors for color A, B, and C, but I think a scrappy version of this block would also be amazing. All seams are a scant 1/4" unless otherwise noted. All paper piecing done with a 1.5mm stitch length. 1. 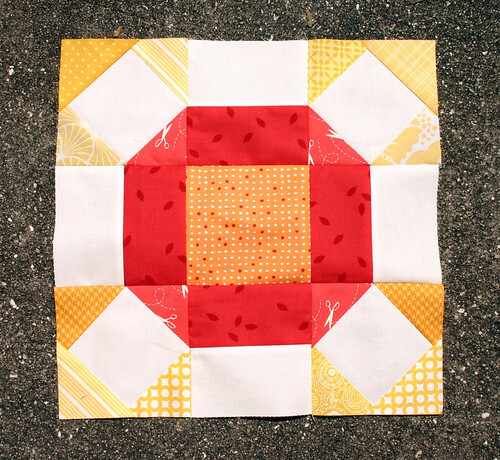 Print four copies of the Radiant Ring Template for each block you're making. 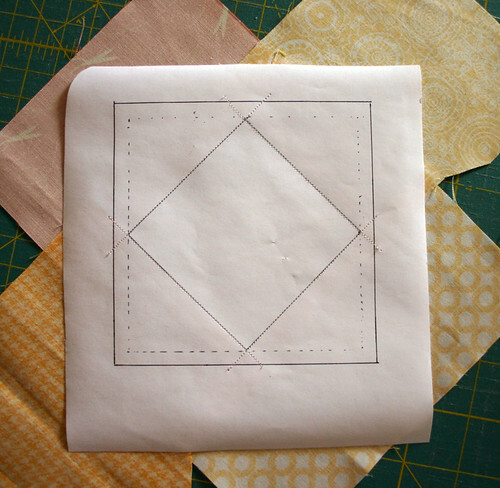 Cut your fabric, and keep in mind that you'll be using the 3.5" x 5.5" rectangles are used for paper piecing. 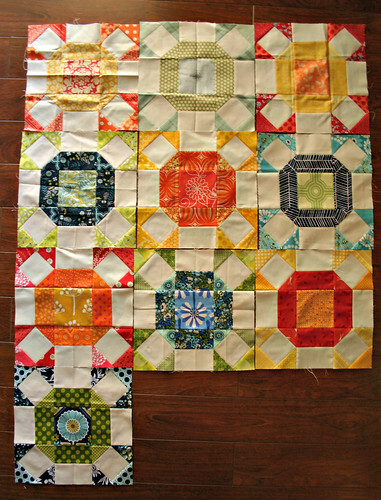 This size worked nicely for me when I was piecing, but you may want to make adjustments after your first block. 2. Let's get the paper piecing out of the way. 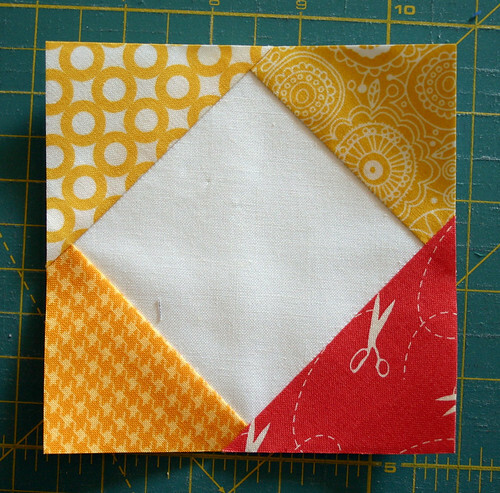 If you've paper pieced before, this is going to be a breeze, and if you haven't, that's okay, too, I'm going to make this as simple as possible. We're going to be making the four corner units using one template each. First, place one neutral 5" square right side out on the back of template, making sure that your square covers the entire template square. Pin in place, in the center. 3. 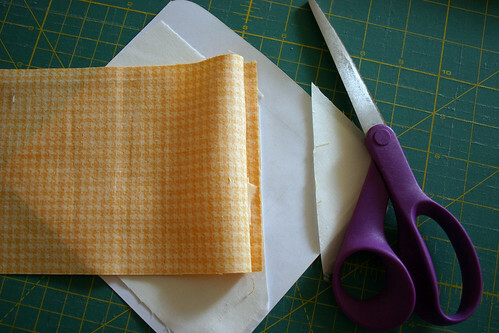 Next, take one of your yellow 3.5" x 5.5" rectangles and line up the long side side so that approximately 1/4" overlaps over the seam line for part A of the template, making sure that the right side of the fabric face down onto the paper. Pin in place, if necessary, and stitch in place. Be sure to stitch into the seam allowance to lock the fabric in place. 4. 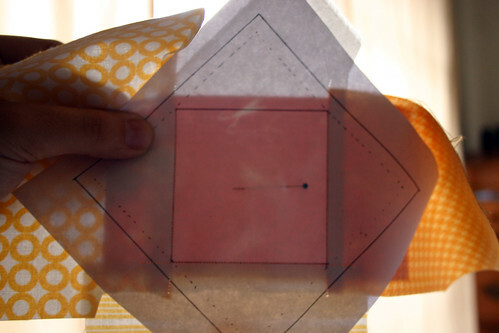 Finger press your yellow fabric in place then press with a hot dry iron. Flip your yellow fabric back and trim the excess neutral fabric to approximately 1/4" or so beyond the seam. Don't worry about trimming the excess yellow fabric yet. 5. Next, flip your template back over so the template faces you. 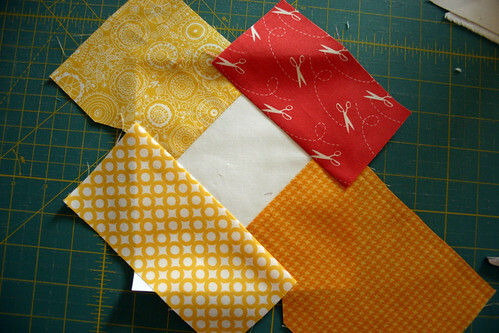 Take another of your yellow 3.5" x 5.5" rectangles and line up the long side side, with the right side of the fabric face down onto the paper, so that approximately 1/4" overlaps over the seam line for part B of the template, which is directly across from part A. Pin in place, if necessary, and stitch in place. Again, be sure to stitch into the seam allowance to lock the fabric in place. 6. 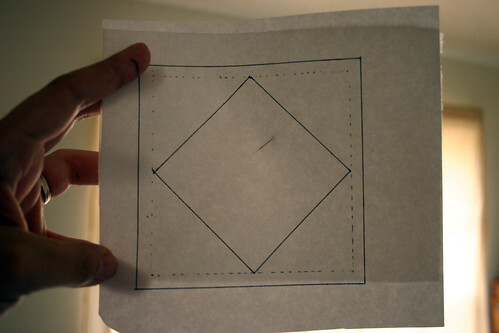 Repeat step 5 for your final yellow rectangle, using part C of the template. 7. Flip your template back over so the template faces you again. Take one of your red 3.5" x 5.5" rectangles and line up the long side side, with the right side of the fabric face down onto the paper, so that approximately 1/4" overlaps over the seam line for part D of the template. Pin in place, if necessary, and stitch in place. Again, be sure to stitch into the seam allowance to lock the fabric in place. 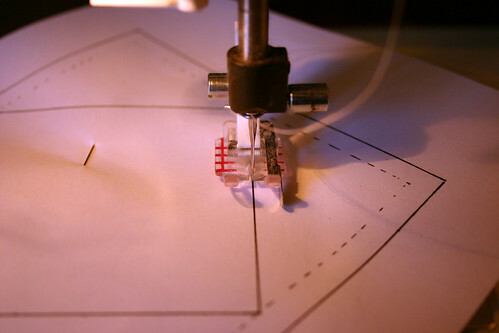 Press your seam open and bring your finished template over to your cutting table. Ugly, right? Let's fix that! 8. Place your template paper side up for this step. 8. Next, let's build the other subunits for this block. 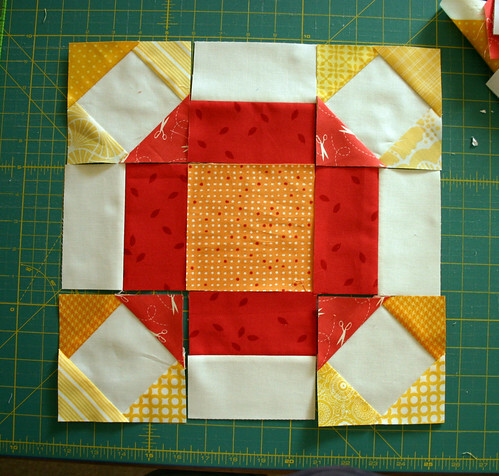 Take the four 2.5" x 4.5" neutral rectangles and pair each one with a red rectangle of the same size. Seam each pair together and press seams open. 9. To finish your block, we're simply going to sew the nine subunits we've created together, in rows of three. First, lay out your subunits as shown below. 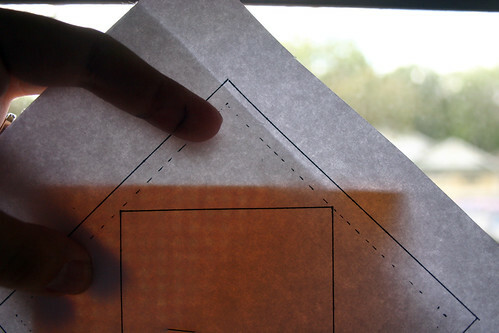 Then, remove the paper from the back of your corner subunits, which should be fairly simple. 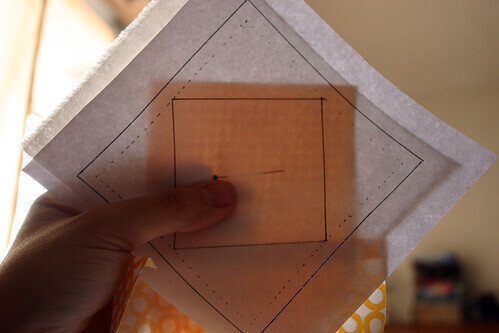 Your stitches perforated the paper, so simply fold back your paper and pull. Repeat for all subunits. Stitch each row of three together, then stitch the three rows together, and voila! A finished gorgeous 12.5" block. A note to the Stash Trad gang: Please make either a Warm or Cool block, using Kona Snow as your background color, and don't hesitate to let me know if you have any questions.